Advocacy on increasing domestic contribution to the HIV responses and promotion of strategic and sustained health financing underpins much of APCASO’s policy and advocacy work. Building on its previous collaboration with the Australian Federation of AIDS Organisations (AFAO) for the Community Advocacy Initiative (CAI) project, which supported country-level advocacy activities on HIV financing, APCASO is actively engaged in key international and regional platforms and spaces to advocate for adequate, equitable, sustainable and evidence-based investments in HIV and health responses. 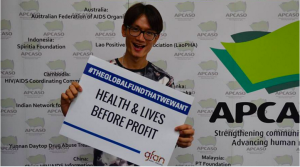 These include APCASO’s role as the Secretariat of the Global Fund Advocates Network for Asia Pacific (GFAN AP), a broad coalition of different HIV, TB, and malaria organisations in Asia-Pacific pushing for increased donor investments for the Global Fund for AIDS, TB, and Malaria (GFATM) and for greater domestic funding for the three diseases. APCASO upholds the right of governments to utilise flexibilities outlined under the World Trade Organisation’s (WTO) Trade-Related Aspects Intellectual Property Rights (TRIPS) Agreement as a mean for securing affordable medicines, vaccines and diagnostics for its citizens. The TRIPS Agreement is a set of international agreements administered by the WTO which sets down the minimum standards for many forms of intellectual property rights (IP) including medicines to be abided by its member states. 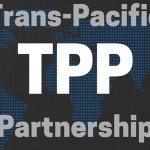 In Asia Pacific, these rights are increasingly being undermined and threatened by the various trade agreements, including the Trans-Pacific Partnership Agreement (TPPA) and Regional Comprehensive Economic Partnership (RCEP). Access to Affordable Medicines Initiative is in collaboration with the Regional TRIPS Working Group, which APCASO is a member of. The Regional TRIPS Working Group aims to increase access to affordable antiretrovirals (ARVs) for HIV and other medicines, vaccines and diagnostics in Asia Pacific by protecting and promoting the utilisation of TRIPS flexibilities by governments. The TRIPS Working Group is comprised of regional community and civil society organisations and networks, including Asia Pacific Network of People Living with HIV (APN+) and amfAR/TREAT Asia and UN technical agencies and partners: UNAIDS Regional Support Team (RST), UNDP Asia Pacific Regional Hub, and World Health Organisation (WHO) Western Pacific Region (WPRO) and South-East Asia Regional Office (SEARO). Advocate for appropriate IP policy reviews and implementations. As part of this program, APCASO, together with APN+, Economic and Social Commission for Asia Pacific (ESCAP), UNDP and UNAIDS hosted the Regional Expert Consultation on Access to Affordable Medicines, Diagnostics and Vaccines on March 15-17, 2016. The consultation also served as a platform for different Asia-Pacific CSOs to intervene in the CSO hearing conducted by the UN High-Level Panel on Access to Medicines in Durban, South Africa. 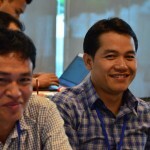 APCASO is the host of the Asia-Pacific Communication and Coordination Platform on Communities, Rights and Gender (APCRG) – an initiative of the Global Fund CRG Special Initiative. The initiative seeks to improve the inclusion of CRG-related interventions in country responses and Global Fund-supported programs to address HIV, TB, and malaria epidemics. Community-centered, human rights-based, and gender-responsive programs are necessary for effective responses for the above diseases. Promote strategic capacity development initiatives in the region. Organising regular APCRG meetings at the regional level to facilitate sharing and collaborations of community issues and priorities across the three diseases.